Abstract: What the Anglo-Saxons ‘‘knew’’ about Asia and its inhabitants was drawn from Biblical exegesis, saints’ lives, and other texts derived from Latin sources. Numerous Old English and Anglo-Latin texts of varied genre and contents give evidence of an intense interest in the East that serves both to define Anglo-Saxon origins and to depict outsiders of varying types that are made to perform as ‘‘Other’’ to members of the Anglo-Saxon community. Ælfric follows Augustine and Isidore in his division of the world into three regions whose people are descended from the biblical Ham, Shem, and Cham; the division is depicted in Anglo-Saxon world maps and referenced in poetry such as the Old English Genesis. The Beowulf-manuscript contains several texts about ‘‘the East’’ including the prose Wonders of the East, Letter of Alexander to Aristotle, and Life of Saint Christopher, as well as the poems Judith and Beowulf . The outlandish creatures described and illustrated in each of these texts figure as outsiders to Anglo-Saxon culture and function to structure masculinity and social cohesion. Images of monstrosity are interwoven with figurations of femininity to bring the ideation of the ‘‘other’’ closer to home. 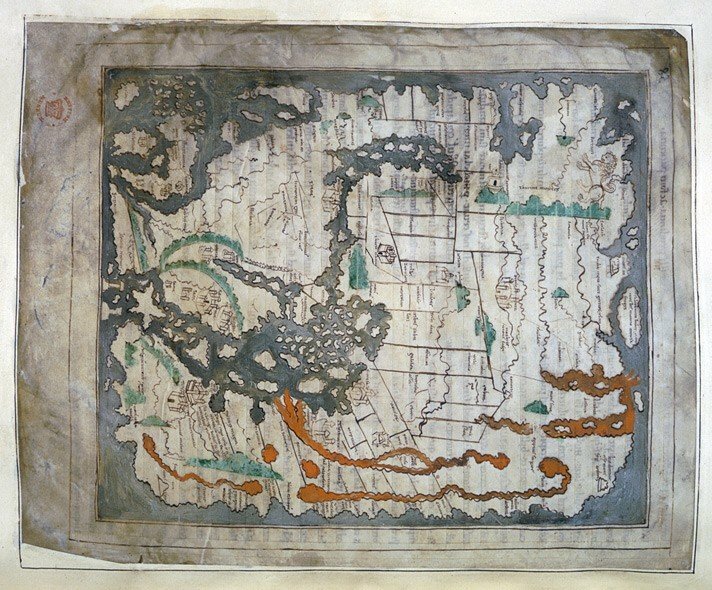 Old English texts that refer to ‘‘the East’’ have more to do with Anglo-Saxon preoccupations with locating themselves geographically and temporally in Christian Europe than with historical realities. ‘‘The East’’ becomes at once monstrous, marvellous, and mysterious, a place of the imagination in quasi-historical accounts ranging from the Letter of Alexander to Beowulf, each of which depicts a realm whose wild characters and characteristics opposed the wished-for stability of roles and functions ‘‘at home’’ among the English. With all of these figurations existing together in a single manuscript, it becomes possible to argue that Asia as a whole functions in the same position to medieval Christian Europe in a comprehensive fashion, anticipating the ‘‘orientalism’’ of the post-medieval period. The ties between Anglo-Saxon England and Rome are close enough that Nicholas Howe once referred to Rome as “the capital of Anglo-Saxon England”. The Anglo-Saxon Chronicle contains several references in ninth-century entries to the “ongelcynnesscole” (“Anglo-Saxon quarter”) in Rome, where English expatriates and visitors could stay in an English hostel or worship at an English church. An Anglo-Saxon bishop who travelled to Rome to receive the pallium left an account of his journey, and the Anglo-Saxon Chronicle and other Old English sources mention numerous other Anglo-Saxons’ voyages to Rome. However, the Chronicle makes almost no mention of places beyond Rome to the east. In the C-Text of the Anglo-Saxon Chronicle alone, it is recorded that in 982‘‘for Odda Romana casere to Greclande, 7 þagemette he þara Sarcena mycele fyrde’’ (‘‘the Roman emperor Otto [I] went to Greece, and there he met a large army of Saracens’’); after large losses on both sides, Otto is the victor. The same manuscript of the Chronicle makes reference to the exiled Norwegian Swein, who in 1052 ‘‘for æror to Hierusalem … 7 wearð hamweard dead æt Constantinopolim’’ (‘‘first went to Jerusalem and died afterward at Constantinople’’). There is no description in either entry of places visited or of the routes travelled by Otto or Swein. Perhaps also not insignificantly, neither Otto nor Swein is English.